Brad Anderson, the director behind the surreal, bleak, stunning THE MACHINIST, descends into genre features for THE CALL - a thriller starring Halle Berry that starts off brilliantly but descends into implausibility. In some ways, the movie is set up in the same way as OLYMPUS HAS FALLEN. 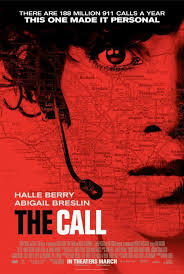 In a thrilling prologue, 911 operator Jordan (Halle Berry) has to listen while a creep (Michael Eklund) offs a young caller. Move to the main body of the film, and Jordan, like Gerard Butler's Banning, is a guilt-ridden specialist trying to redeem herself. In this case, she's called in when the same creep abducts a young girl called Casey (Abigail Breslin) and puts her in the trunk of a car. The majority of the movie sees Jordan guiding Casey through tricksy attempts to alert passing drivers and the tension is palpable,thanks partly to DP Tom Yatsko's superb digital lensing, but mostly to the strong performances by Breslin and Berry. The problem is that in the final act, the movie gets into Scooby Doo territory with the standard stupid chase in the spooky cabin in the woods that Whedon spoofed so brilliantly. THE CALL is on release in the USA, Russia, Canada and Lithuania. It opens on April 5th in Brazil; on April 18th in Argentina; on May 3rd in Sweden; on May 9th in Greece and on July 5th in Turkey. THE CALL has a running time of 94 minutes and is rated R in the USA.